Los Alerces National Park is a visually stunning Andean landscape moulded by glaciations. It is covered by lakes and temperate forests that include the best conserved pockets of globally endangered Alerce tree species. The Alerce (or Patagonian Cypress) is the second longest living tree species in the world (> 3,600 years). “No bus.” I stood there at a loss. I had made my way past four travel agencies in Esquel and now stood in the local tourist office. “Tomorrow, sorry, but no bus. Bus was today. Next bus is on Saturday.” Everyone had told me that, so it was of little surprise. Still, I wasn’t happy as this was my last chance. I let that one sink. The last time (and the first time for that matter) I hitchhiked was back in January. At the time I was in Donana National Park and the bus connection with Sevilla was rather awkward. To kill time I figured to walk to the coast and see the beach on a winter day (recommended) and check out if another park visitor center was opened. Eventually, a car driven by an elderly Spanish couple stopped and asked if I needed a ride. They dropped me off at the visitor center. After I had completed my visit, I decided to go all in, put my thumb up and in 5min had hitched a ride to the beach. So, I thought ... Let’s try this in Argentina. That night I slept very little, always worrying about not getting back in time or how it would work. Then around 8:30h I went to the junction holding up my thumb. In total it took me 2h to reach the park. Not too bad I would say and a nice experience. The key to fame of the park are the Alerces trees, the second oldest species (after Sequoias). I only managed to see one tree as the main area was not reachable. You need a boat and that was not running daily (yet again) due to me arriving in pre season. But, luckily, the Alerces are not the only asset of the park: glaciers, trees, mountains, lakes ... I felt reminded of the great North-American national parks. On my way back I was dropped off in Trevelin, a town founded by former Welsh immigrants. I cannot specifically recommend going there as little Welsh heritage remains. But there are hourly busses back to Esquel and with hitchhiking you take what you get. Looking back, Los Alerces was a nice and fitting conclusion to my first time in the Andes. I would encourage you to visit yourself if you are travelling along Ruta 40. Even if it weren’t for the Alerces trees, I feel the park deserves its WHS status. 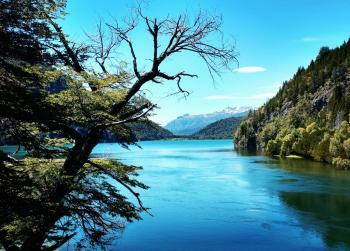 It’s substantially further north than Los Glaciares/Torres del Paine and represents a different eco system. I do feel, though, that the inscription could be even stronger, if it also covered the western side of the Andes in Chile. The hub for Los Alerces is Esquel, a nice town on Ruta 40. 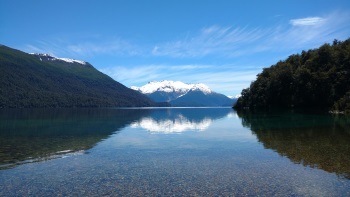 From Esquel you have connections up north to Bariloche, east to Puerto Madryn for Peninsula Valdez (9h night bus) and south for Perito Moreno for Cueva de los Manos (5h bus). To get from Esquel to Los Alerces you can take a bus on Wed, Sat and Sunday, I believe. Organized tours to the park are also available, but again, not sure about the schedule, specifically in pre season. Main season is from Jan to Feb. Contact the Esquel tourist office or Siempre Verde Tourist Agency in Esquel for more information. If you want to or have to hitchhike yourself, it wasn’t all that complicated: Go to the western roundabout (End of Don Bosco Avenue). There is a bus stop. Here, stick out your finger. If you get really lucky, you may get a ride to Los Alerces. I tried for an hour, but failed and then replanned. Instead hitch a ride direction Trevelin (should take less than 10min from my experience). Get off at the junction for Los Alerces. Every car that passes here goes to the park. And in a worst case situation, you can always take the bus back that runs between Trevelin and Esquel. You should speak a little Spanish, though, to make conversation. In my case it took me literally 1min to hitch the connecting ride after I had made it to the junction. The park is really large and there are little to no trails. The best collection of Alerces trees can only be reached by boat. In any case, if you want to see a little of the park either bring your own ride (mind the gravel). Or hitchhike some more. It should go without saying, but: Don’t be stupid if you are going to hitchhike. My track record for tipping whs isn't spotless. This one I got right, though.